Social media marketing with video by Concepts Media Company is the best way to develop meaningful engagement on social media platforms. Google loves video, so much in fact just placing your video on your websites homepage will increase your businesses chances of getting on the first page of Google by 53%. 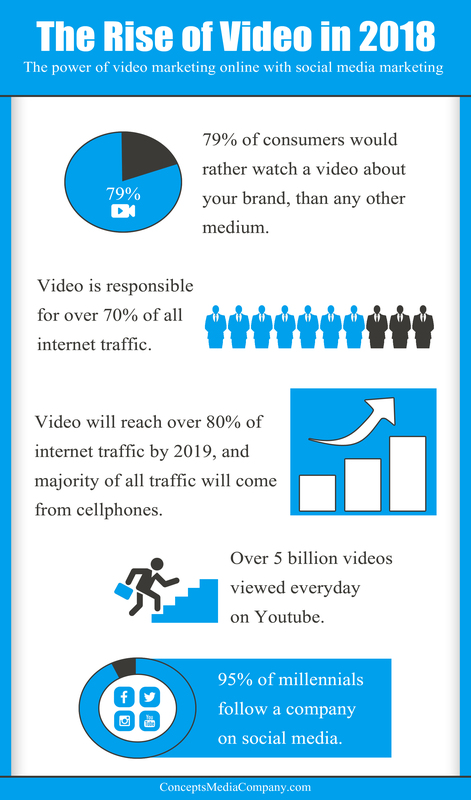 Also Google owns Youtube, and with more than 5 billion videos watched daily on Youtube, marketing your business with video increases your businesses exposure more than any other form of marketing. Each package includes custom build out of 4 social media networks, (Facebook, Twitter, Instagram, Pinterest pages, Youtube) each custom branded to your companies image. Designed and optimized to build your brand awareness. Clients receive quarterly social media audits, which includes your analytics on all social media networks, (how manys post views, top location for your posts, age, gender, and post engagement demographics for each post) and our strategic recommendations for your campaign. Every client receives a social media marketing strategy that is custom to their industry and business. Including highest traffic times and best days of the week to post, and with level 2 and 3 packages includes AvsB tests showing the results of location vs gender/age targeted ads. Find out more about marketing your business with video on social media through Concepts Media Company. CMC offerers strategic social media marketing options and video production located in Port Saint Lucie, Fl.